Recently Savvy Sis enrolled herself in a French cooking class and I was amazed some of the little tips which sounded easy but would not have done it myself. 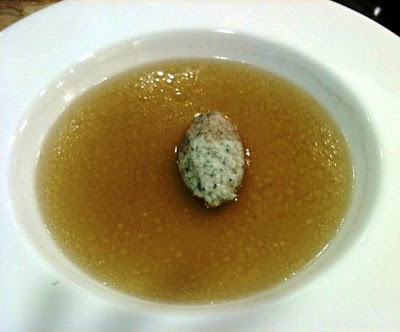 For the longest time, I would dine at Mariposa in Newport Beach for the yummy chicken consomme. Now, I am going to DIY at home. Well, I am going to try. Stay posted for my DIY gourmet chicken soup. We all know to make chicken soup, chicken and chopped veggies are needed. This is not rocket science. However to go beyond simple home cooking, the chef caramelized half onions before adding to chicken stock. This way, flavor will be intensified with added sweetness. In addition, make sure to trim all fat from chicken. We don't need to spend hours slaving over the stove to make a delicious bowl of chicken soup. However I thinking caramelized onion will certainly gourmet-up our everyday chicken noodle soup on a cold winter day. How do you gourmet-up your chicken soup? *Don't forget to enter Orient Watch Giveaway on the right side bar. I could eat caramelized onions on ANYTHING. Seriously. Probably even wood. I will have to try caramelized onion. It sounds delicious. I used to throw everything but the kitchen sink in my chicken soups because I like them chunky - noodles, carrots, celery, peas, corn, okra, tomatoes - guess I was making a stew! The caramelized onions idea sounds delish! Oh, yum, carmelized onions? Great idea! That is a great tip. I haven't had chicken soup in a while. The next time, I make one, I will try to remember to caramelize the onions first before to add the chicken broil. hm... yummi yum yum.... want to test it do u have the recipe for this? so yummy can you send me 1 spoon?